To get ready for tomorrow’s book launch of the Belly Fat Cure, Jorge Cruise has prepared a series of “Ask Jorge” videos on YouTube to answer the most common questions people have about health and wellness. Jorge also invites you to visit his YouTube Channel to submit your own questions on fitness, wellness, motivation, nutrition, and health. Jorge will be drawing from the submitted questions for future Ask Jorge videos. So if you have a pressing question about the Belly Fat Cure or health in general, then just click here to visit Jorge’s YouTube page for “Ask Jorge” and click on the big red “Submit A Question” button. I personally find YouTube’s page for the Ask Jorge videos a little annoying to navigate so I’ve gone ahead and provided all of the Ask Jorge questions so far and put them in order and you can check them out below. If you’re interested in picking up Jorge Cruise’s “Belly Fat Cure” book from Amazon, just click here. We’re starting with Video # 22 because of the way YouTube is set where the most recent video is the first video you see, so the Introductory video is labeled # 22, and Jorge’s first 21 Ask Jorge Questions appear below it. Ask Jorge #1: What Is The Best Diet For Weight Loss? Ask Jorge #2: What’s The Best Diet Pill For Weight Loss? Ask Jorge #3: What Is The Best Food To Eat To Lose Weight? 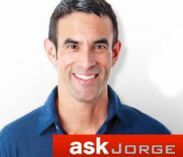 Ask Jorge #4: What Is The Safe Rate At Which To Lose Weight? Ask Jorge #5: Can I Eat Chocolate And Lose Weight? Ask Jorge #6: Can I Drink Wine On A Diet? Ask Jorge #7: Is Sugar Bad For Me? Ask Jorge #8: Is Fat Bad For Me? Ask Jorge #9: Do I Have To Eat “Diet Food” To Lose Weight? Ask Jorge #10: Should I Eat Fat-Free Foods To Lose Weight? Ask Jorge #11: Is There Any Fast Food That’s Healthy? Ask Jorge # 12: Do You Think I Have To Join A Weight Loss Group To Lose Weight? Ask Jorge #13: How Do I Get Rid Of My Belly Fat? Ask Jorge #14: How Do I Find Healthy Recipes? Ask Jorge #15: How Do I Teach My Kids About Health? Ask Jorge #16: How Can I Pay Less On Health Insurance? Ask Jorge #17: Are There Other Free Health Resources Online? Ask Jorge #18: Where’s The Best Place To Find Nutrition Facts? Ask Jorge #19: Should I Take Vitamins? Ask Jorge #20: What Is The Fastest Way To Lose Weight? Ask Jorge # 21: I Need More Energy – What Can I Do? I have Your bookBelly Fat Cure and i am on the 15/6 plan. and how does it fit into the plan. Thank You Robert Rider.